Brushaber v. Union Pacific Railroad Co.: The Supreme Court of the United States upholds the national income tax. March 24 – French ferry SS Sussex is torpedoed by SM UB-29 in the English Channel, with at least 50 killed (including the composer Enrique Granados), resulting on May 4 in the Sussex Pledge by Germany to the United States, suspending its intensified submarine warfare policy. April 24–30 – The Easter Rising occurs in Ireland. 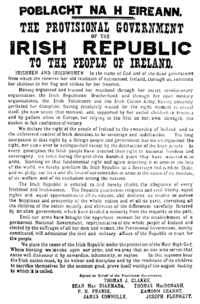 Members of the Irish Republican Brotherhood proclaim an Irish Republic, and the Irish Volunteers and Irish Citizen Army occupy the General Post Office and other buildings in Dublin, before surrendering to the British Army. April 24–May 10 – Voyage of the James Caird: An open boat journey from Elephant Island in the South Shetland Islands to South Georgia in the southern Atlantic Ocean (800 nautical miles (1,500 km; 920 mi)) is undertaken by Sir Ernest Shackleton and five companions, to obtain rescue for the main body of the Imperial Trans-Antarctic Expedition, following the loss of its ship Endurance. May 31–June 1 – WWI: Battle of Jutland, between the British Royal Navy's Grand Fleet and the Imperial German Navy's High Seas Fleet in the North Sea, the war's only large-scale clash of battleships. The result is tactically inconclusive, but British dominance of the North Sea is maintained. July 1– November 18: Battle of the Somme between British and German. July 1–November 18 – WWI: Battle of the Somme, opening with explosion of the British Y Sap mine and the Battle of Albert: More than one million soldiers die, with 57,470 British Empire casualties on the first day, 19,240 of them killed, the British Army's bloodiest day. The immediate result is tactically inconclusive. July 1–12 – Jersey Shore shark attacks of 1916: At least one shark attacks 5 swimmers along 80 miles (130 km) of New Jersey coastline, resulting in 4 deaths and the survival of one youth, who requires limb amputation. This event is the inspiration for author Peter Benchley, over half a century later, to write Jaws. July 15–19 – WWI: Battle of Delville Wood – 766 men from the South African Brigade are killed, in South Africa's biggest loss during the First World War. July 19–20 – WWI: Battle of Fromelles – An attack by Australian and British troops is repulsed by the German army, with heavy casualties. August 3–5 – WWI: Sinai and Palestine Campaign – Battle of Romani: British Imperial troops secure victory over a joint Ottoman-German force. September 6 – The first true self-service grocery store, Piggly Wiggly, is founded in Memphis, Tennessee, by Clarence Saunders, opening 5 days later. September 15–22 – WWI – Battle of Flers–Courcelette, France: The battle is significant for the first use of the tank in warfare; also for the debut of the Canadian and New Zealand Divisions in the Battle of the Somme. ^ Bailey, Peter (December 15, 2005). "Torpedoed on the crossing to Dieppe". Sussex Express. Lewes. Retrieved August 23, 2013. ^ The Hutchinson Factfinder. Helicon. 1999. p. 483. ISBN 1-85986-000-1. ^ "Woodrow Wilson". Scouting.org. June 15, 1916. Retrieved December 10, 2015. ^ Sheffield, Gary (2003). The Somme. Cassell. p. 68. ISBN 0-304-36649-8. ^ "See you at the Piggly Wiggly". Pink Palace Family of Museums. Archived from the original on October 14, 2007. Retrieved October 22, 2007. This page is based on the Wikipedia article 1916; it is used under the Creative Commons Attribution-ShareAlike 3.0 Unported License (CC-BY-SA). You may redistribute it, verbatim or modified, providing that you comply with the terms of the CC-BY-SA.